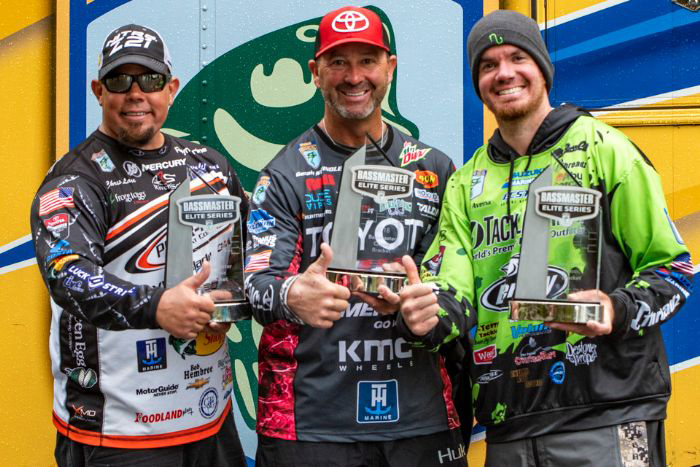 Chris Lane (left), Gerald Swindle (center) and Adrian Avena are all headed to the 2019 Bassmaster Classic after winning their respective brackets at last week's Classic Bracket. At first blush, most would figure Carters Lake, the venue for last week’s Bassmaster Classic Bracket, to set up much like Lake Chatuge, site of the recent Elite Series Angler of the Year Championship. The lakes are situated 75 miles apart in the picturesque mountains of north Georgia with Chatuge straddling the Georgia-North Carolina border. 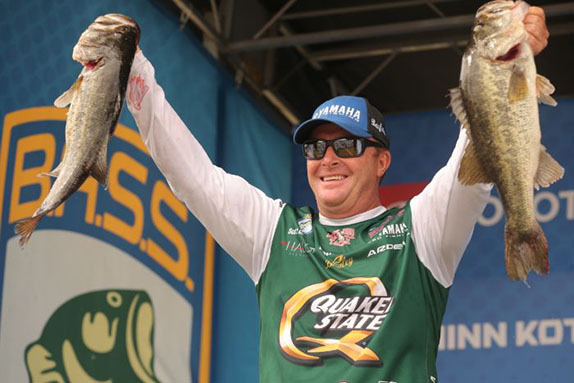 Both are loaded with spotted bass and topwaters were the dominant producer at Chatuge, so it was a safe bet many of the 16 competitors in the Bracket showdown expected Carters to lay out like Chatuge Jr.
Once things began to unfold at Carters, however, it became evident the only meaningful similarity between the lakes was that they were both filled with fresh water. Of the three anglers who claimed the Bassmaster Classic berths up for grabs, only Chris Lane relied heavily on a towpater. Adrian Avena fished deep around suspended fish relating to bait while Gerald Swindle called it an old-fashioned junk-fishing event. The three divergent approaches all resulted in the same outcome – a guaranteed trip to Knoxville, Tenn., next March for what is likely to be a memorable Classic. 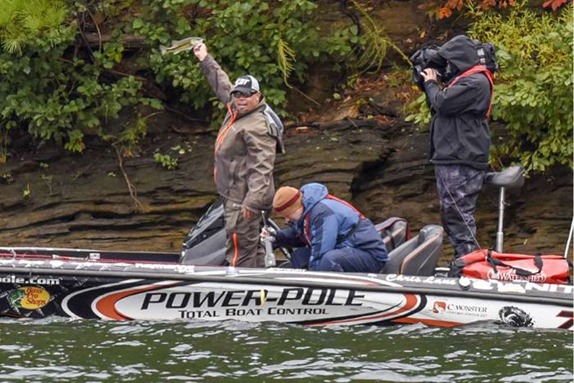 Avena, Lane and Swindle all have committed to compete on the Bass Pro Tour next year so the 2019 Classic could be their last. Swindle, a two-time Angler of the Year, said it was possibly the most stressful route to a Classic berth he’s ever taken. The 2019 Classic will be the 18th of his career. “I went to this bracket with a different mindset and came in more aggressive than I had fished all season,” Swindle said. “I wanted to be in this Classic. I didn’t want my last day of Elite Series competition to be at Chatuge and I left there with one more chance to write my story and cross that Classic stage. Below is a recap of how the three winners conducted their business at the small lake nestled in the Blue Ridge Mountains of northern Georgia. Avena said Carters was a “much different animal” than Chatuge and he applied what he learned from his experience in the Classic Bracket last year over the course of the week. The biggest clue he derived from the single practice day were the three bites he got on a dropshot in 50-plus feet of water. “I didn’t know what that meant, and I didn’t know if that meant I could catch them that way, but I had bites in water I felt other guys wouldn’t be fishing,” he said. On a 3,200-acre lake, that’s a big deal. During the seeding round, when all 15 anglers competed for 12 spots in the bracketed match portion of the event, Avena tried to target the suspended fish, but wound up scrambling most of the day. His 6-13 limit was good enough for 9th, which put him in a semifinal match against Ray Hanselman, Jr.
“In a perfect world, I’d have caught eight or nine pounds and then went into practice mode, but I had was in scramble mode trying to figure out how to catch ‘em,” Avena said. With the match against Hanselman broken into two three-hour sessions over two days, Avena knew devoting lengthy stretches of time to graphing for more suspended fish wasn’t feasible. In the first session against Hanselman, he scrounged together four keepers for 4-15, which at Carters could be considered a solid total. He continued to sling a dropshot in the second half of the semifinal match, but was only able to muster one keeper for 1-01. Hanselman struggled as well, logging three keepers total for a 3-02 aggregate weight. After beating Hanselman, Avena moved on to the final match of his bracket against Shinichi Fukae. With a six-hour match, he knew he’d be able to put in some screen time searching for the deeper fish he’d found in practice. After spending the first 30 minutes shallow and coaxing two bites with topwaters (he didn’t land either), he moved off the bank and put his electronics to work. He stayed in the same creek arm since that’s where he’d seen the most bait on the practice day. “If the deep bite was available, it’d be in there,” he said. “I did figure it out, but unfortunately they were still small. He said the bait was scattered between 30 to 40 down with the bass under them. A dropshot and a chrome spoon that he hand-painted in his hotel room were his best weapons. Avena, who hails from New Jersey and grew up chasing saltwater species, didn’t warm up to bass fishing until his college years, but now he’s headed to his first Bassmaster Classic and he couldn’t be happier. > Dropshot gear: 6’10” medium-light Abu Garcia Fantasista Premier spinning rod, Abu Garcia Revo Premier 30 spinning reel, 8-pound Berkley X5 braided line, 6-pound Berkley Trilene 100% fluorocarbon line (leader), size 1 unnamed straight-shank worm hook, 4.5’ unnamed hand-poured worm, ¼- to 5/8-oz. unnamed tungsten dropshot weights. > He varied his weight based on what he was fishing around. When casting around structure, he went with a lighter size. When dropping vertically, he upsized it to trigger reaction bites as the bait fell through the group of bass. > Spoon gear: 7’ medium-heavy Abu Garcia Fantasista Premier casting rod, Abu Garcia Revo Rocket casting reel (10.1:1 ratio), 12-pound Berkley Trilene 100% fluorocarbon line, 1.5-oz Hopkins Shorty spoon (hammered chrome). > Avena added some custom paint patterns to the spoons (pink and white) and upgraded the stock hook to a #2 Berkley Fusion19 treble. Chris Lane shows off one his keepers at Carters Lake. 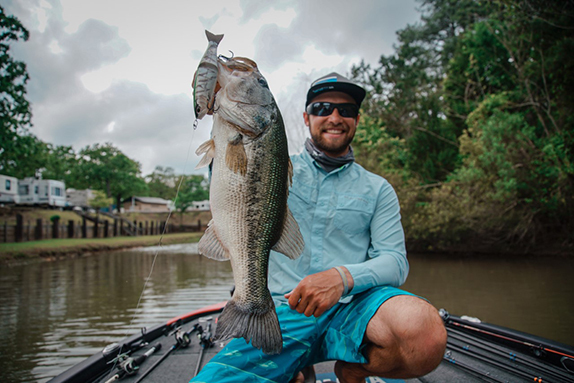 As Lane saw it, Carters and Chatuge were pretty similar and much of that was because he relied on a topwater to score a runner-up finish at Chatuge. The only difference at Carters was his use of a jerkbait when the wind and rain moved in for the final day. He was laboring during the seeding round, but picked up a Whopper Plopper in the final hour and scored a 5th-place finish with 9-12. His late flurry earned him a matchup against Chad Pipkens in the semis. The first half of their duel kicked off in the afternoon and Lane felt he’d have a leg up since that’s when he was able to capitalize on the topwater bite the day before. At the end of the first session, Lane had one keeper (2-03) to his name while Pipkens had three for 3-00. “He put it to me pretty quick,” Lane said. His fortunes turned around the following morning as he logged three keepers for 8-09, including a 4-10 brute, that gave him separation and, ultimately, the win. Lane, who’s competed in the Major League Fishing Selects, hammered away with the Plopper in the backs of creeks and pockets and along points, coaxing bites from the ultra-clear water. 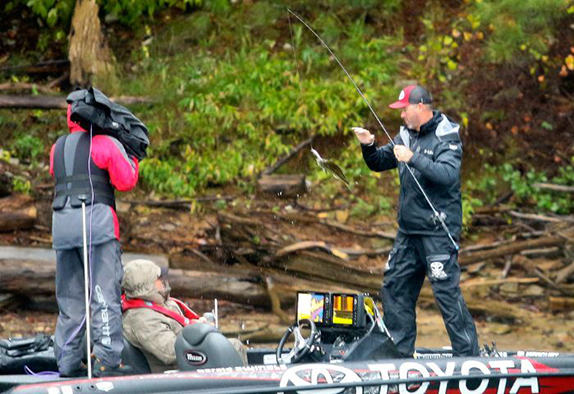 In the finals of his bracket against Greg Vinson, Lane shifted gears to a jerkbait in the inclement conditions and it produced alongside the Plopper. It gave him an effective 1-2 punch as he sought out new water. 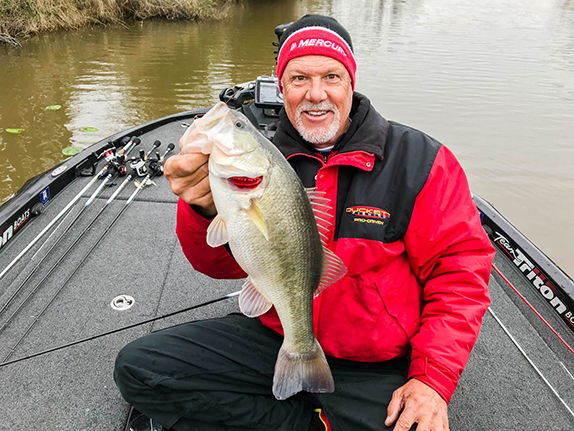 “It was really windy in the morning so I went to the jerkbait and that made all the difference in the world,” he said as he posted a limit worth 10-12, besting his Alabama counterpart by nearly 5 pounds. Nothing was consistent, though, and that added to the stress. > Topwater gear: 7’4” medium-heavy Bass Pro Shops Johnny Morris Platinum Series casting rod, Bass Pro Shops Johnny Morris Platinum Series casting reel (8.3:1 ratio), 50-pound Bass Pro Shops XPS Hyperbraid line, River2Sea Whopper Plopper 130 (bone). > Jerkbait gear: Same rod (7’ medium-action), same reel (6.3:1 ratio), 10-pound Bass Pro Shops XPS fluorocarbon line, 4.5” Luck E Strike RC STX jerkbait (purple green apple). > Lane swapped the jerkbait hooks for stiffer #6 Lazer TroKar trebles, which helped the bait hold a little deeper. Gerald Swindle settled into junk-fishing mode at Carters Lake and it allowed him to earn his 18th career Classic berth. Swindle was among those who figured Carters would set up like a smaller version of Chatuge. What he found was a lake where the baitfish stayed deep, a stark contrast to the roaming wads of blueback herring at Chatuge. His mindset for the seeding round was to simply catch enough to survive. “I had an idea it wouldn’t be too high,” he said. He got a few bites on a flutter spoon in 40-plus feet right away in the morning and rotated through other presentations as he moved around the lake. “I moved around and around,” he said. “I fished deep with a worm and caught them deep with a shaky-head in 35 feet. There were fish on a deep bluff transition where turned to clay. I’m not sure what kept telling me to keep going there, but there were only a few shoals in the whole lake the other were hitting them hard. In the opening portion of his match against Mike McClelland, he started on a clay point where he’d caught one and lost one the day before. A shaky-head produced a keeper on his first cast. He had only one other bite until the final 10 minutes when a 3-05 spotted bass slurped up his Trick Worm to give him 6-13 to McClelland’s 2-07 (one fish). He knew he couldn’t rest on the 4 ½-pound cushion he’d built for the second half of his duel with his good friend. Before long, McClelland surged ahead by a couple ounces, prompting Swindle to quit fishing deep. It was enough to edge McClelland by three ounces to move into the final against Scott Rook. The totals of his match with Rook – Swindle’s limit weighed 11-06 dwarfed Rook’s single keeper worth 1-14 – told the story of a blowout, but Swindle said it was anything but. The key to the final day was his decision to start his match against Rook fishing around the ramp where the competitors took off from. Each day, he’d noticed baitfish activity around after the boats departed. He scanned around, left to fish other spots, then came back and caught a 3 ½-pounder later on. He kept a positive attitude in the face of miserable weather and was realistic about when he needed to do. A dropshot, a shaky-head, a buzzbait, a wakebait and jerkbait all produced keeper bites for Swindle as he barreled his way into another Classic. “It was just typical, old-school fishing, staying in the wind and making one bite,” he said. > Shaky-head gear: 6’10” medium-heavy Quantum Vapor spinning rod, Quantum PT 30 spinning reel, 10-pound Sunline SX1 braided line, 8-pound Sunline Shooter fluorocarbon line (15-foot leader), ¼-oz. unnamed shaky-head jig, Zoom Trick Worm (green-pumpkin blue).